Chia seeds were a staple food of ancient cultures. The Aztecs, Mayans and Native Americans valued chia seeds as a source of concentrated energy and nutrition. This tiny superseed has survived the ages and the Chia Pet craze to become a valuable ingredient for gluten-free cooks. You may have heard about the importance of adding omega 3 fatty acids to your diet. Omega 3 fatty acids are polyunsaturated fats, important to health because they are known to reduce inflammation and risks for cardiovascular disease. A 1-ounce serving of chia contains approximately 4.9 grams of omega 3 fatty acids. Comparatively, flaxseed – another good plant source of omega 3 fatty acids – supplies about 1.8 grams of omega 3 fatty acids in a 1-ounce serving. Soluble fiber has been credited with maintaining normal, healthy cholesterol levels and supporting healthy elimination. 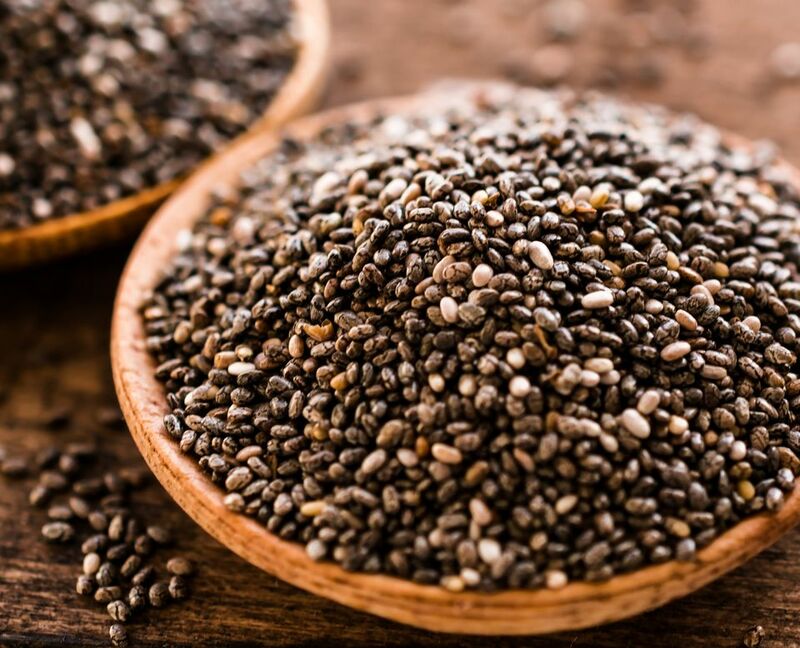 A 1-ounce serving of chia seeds contains 10.6 grams of fiber. Compare that to oatmeal, another good source of soluble fiber. A 3/4 cup of gluten free oatmeal supplies about 2.8 grams of soluble fiber. Compare chia seeds to flaxseeds, which supply about 7.6 grams of fiber in a 1-ounce serving. Obviously, if you are working to increase the amount of soluble fiber in your diet, chia seeds deliver. We automatically think dairy foods when we think about adding calcium to our diets. But the plant world is full of foods that are rich sources of calcium. Broccoli is a great source of easily absorbable calcium and it turns out, so are chia seeds. A 1-ounce serving of chia seeds supplies 177 mg of calcium. Just one 5-inch stalk of steamed broccoli contains 56 mg of calcium. Are you a vegetarian? If so, you may be looking for good plant sources of protein. A 1-ounce serving of chia seeds contains 4.4 grams of protein. Compare that to a 1-ounce serving of kidney beans which supply .01 grams of protein. As you can see, ounce per ounce chia seeds are a concentrated source of nutrition. Use chia seeds to replace eggs in recipes. When mixed with water, chia seeds, high in soluble fiber, form a thick gel. Place 1 tablespoon of chia seeds in a cup and add 3 tablespoons of water. Allow the mixture to sit for about 15 minutes. 1/4 cup of hydrated chia seeds equals approximately 1 egg. Sprinkle chia seeds on cereals and yogurt. Use chia seed flour in a wide variety of gluten-free recipes as a 1-to-1 replacement for wheat flours. Baking tips for using chia flour in gluten-free baking: Sift chia seed flour before using, use smaller pans when baking with chia seed flour and increase baking time by about 5 percent. For example, if a recipe calls for a 60-minute baking time, increase the time by about 3 minutes for better results. When learning to use a new gluten-free ingredient like chia seed flour, experiment! Take note of baking time, size of pans, and types of recipes used. Why Is Folate Important on a Gluten-Free Diet?